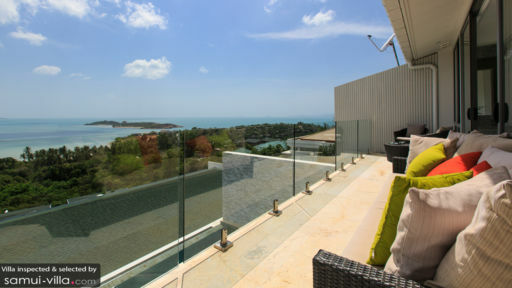 A truly modern and elegant home in tropical Koh Samui, Villa Sanctuary Apsara as it suggests is a sanctuary for guests looking to spend some time idling away by the beaches in Samui or sipping on chilled cocktails while sweeping views keep you company. This three-bedroom penthouse apartment features contemporary and crisp interiors dominated by classic, white tones. Floor-to-ceiling glass doors lead to the stunning pool deck and a view that is so unbelievable it will take some time sink in. Along the coastline and distant horizon, the villa provides first-class seats to a spectacle you will never forget. The three bedrooms are furnished with king-sized beds and two of these are ocean-facing with private balconies and outdoor seating. The modern bedrooms are air-conditioned and are packed with amenities to keep you comfortable. Designed with monochromatic artwork depicting old-folk tales, the bedrooms are uniquely designed with either white or rustic shades of ochre and warm orange. The bedrooms are splendid for a comfortable night’s sleep. There are ensuite bathrooms with proper amenities including sunken bathtubs, step-in showers, and dual vanities. The infinity swimming pool is the crowning jewel at Villa Sanctuary Apsara with its mosaic-tiled, turquoise water body. 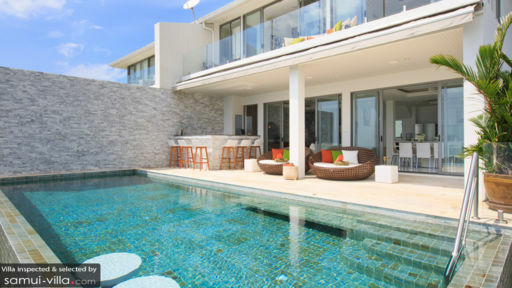 It even features a few embedded stools that are perfect for enjoying the view while you’re inside the pool. The sun deck has circular rattan daybeds under a shaded roof meant for napping, resting, and some reading if you are up for it. Right beside it is the outdoor bar with stools and a counter where you can grab some evening bubbly or a glass of wine while baking in the tropical ambiance. Large glass doors slide open to reveal the spacious, multipurpose living room at the villa with all-white interiors, a striking wall art featuring Lord Buddha, and a statement wall with a mounted flat-screen TV. The surround sound system is perfect for throwing parties with friends and family. The centrally air-conditioned room has plush seating with white sofas facing the TV. When you want to kick back and relax after a long, hard day of activities, the living room comes to the rescue. The beautifully designed living space is also home to the dining area and a fully-equipped modern kitchen. Keeping up with an all-white theme, the eight-seater dining table is beautifully laden with the finest crystal and cutlery, white chairs, and a white table-top. All around you, the awe-inspiring scenery of the tropics is never far behind. The open kitchen is uniquely modern with top of the line appliances, a swanky breakfast bar with seating, elegant fittings, and advanced technology. Get your morning coffee fix with the state of the art coffee machine and if you are into baking, then the oven will definitely be put to some good use. The staff is generous and well-trained to offer top-class services to guests as well as to maintain the house. You can request for an in-villa chef if you do not wish to cook your own meals. There are massages and transportation that can be arranged upon request as well. Additional services are charged extra. Villa Sanctuary Apsara is idyllic in setting and location not too far from Big Buddha and offering a more private retreat to guests. Nearby you have the likes Choeng Mon, famous for its beach, restaurants, and cafes. 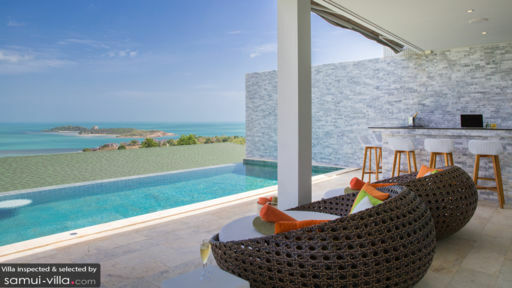 Views encompassing neighbouring islands and the ravishing coastline can be enjoyed right from the villa.